When you click on the "Buy now" link above, you will be directed to Amazon.com. Abstract: In the last 20 years there has been an increasing focus on study of Ainu culture in Japan, the United States, and in Europe. This has resulted in a number of major exhibitions and publications such as “Ainu, Spirit of a Northern People” published in 1999 by the Smithsonian and the University of Washington Press. While such efforts have greatly enhanced our general knowledge of the Ainu, they did not allow for a full understanding of the way in which the Ainu regarded and used plants and animals in their daily life. This study aims at expanding our knowledge of ethnobiology as a central component of Ainu culture. 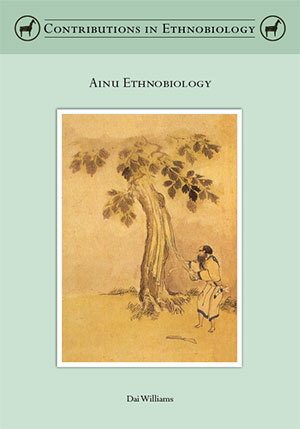 It is based in large part on an analysis of the work of Ainu, Japanese and Western researchers working in the 19th, 20th and 21st centuries. Dai Williams was born in Lincoln, England in 1941. He received a BA in Geography and Anthropology from Oxford University in 1964 and a MA in Landscape Architecture from the University of Pennsylvania in 1969. He spent the majority of his career in city and regional planning. His cultural research began through museum involvement in the San Francisco Bay Area. Based in Kyoto from 1989 he began research on the production and use of textiles in 19th century rural Japan. His research on the Ainu began in 1997 but primarily took place in Hokkaido between 2005 and 2009. Fieldwork focused on several areas of Hokkaido, like the Saru River Basin and the Shiretoko Peninsula, which the Ainu once occupied. In addition, Williams met with and worked with a number of Japanese researchers who focus on Ainu culture and ethnobiology. Downloadable PDF file, 228 pp. with colour images (19.6 MB).